Hard gun cases are some of the best things for any gun owner. Of course, not just any case will do since you need both security and protection in order to ensure that it keeps the wrong people out but still keeps your valuable firearm in perfect condition no matter how the case is handled. Pelican’s Storm line of cases aren’t quite as varied in size as their elderly Protector line, but they’re super lightweight and easy to function and that makes them ideal for gun owners who aren’t worried about case abuse or theft in many cases. A Little About Pelican Products, Inc.
Pelican had some rather humble beginnings, founded in 1975 with the express purpose of manufacturing lighting and waterproof cases for scuba divers, the company operated as a grassroots mail-order business for some time. Their products were high-quality from the start, and their original line of cases is still sold, the Pelican Protectors. In 2004, the company was acquired by the private equity firm Behrman Capital after which the company experienced a veritable explosion of growth in both it’s holdings and it’s product lines. While we’re mostly interested in their gun cases, the company produces a wide array of high-quality products ranging from flashlights to electronic cases for smartphones in addition to their awesome hard cases. For gun owners, there are three primary lines of products to take a good look over. The first and still some of the best, these hard cases are designed to be able to withstand just about anything. They’re designed to handle just about any device which you can fit inside of them as well, and have all of the key features which make them both rugged and useful. A little bit newer to the market than the Protector line of cases, the Pelican Storm line has a little bit more innovation pushed into their latches. They automatically lock when closed, but once unlocked allow the case to slide open with an easy touch. While they might be a bit much for the average hunter, these specialized cases are made to hold larger amounts of firearms and have custom interiors to make it possible. If you’re looking into storing large amounts of firearms or a custom case for something not readily available to the public then you’ll want to take a look at this line of hard cases. 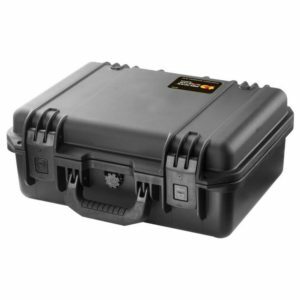 Pelican markets their cases for a large variety of equipment, and with a few exceptions with pre-molded foam, you may find yourself on your own without a guide to which cases are suitable. The important thing is to make sure that the dimensions will allow you to fit the gun and accessories you’re looking to protect, with the exception of a few pre-sculpted, hard-foam models you’re pretty much free to fit things however you see fit. 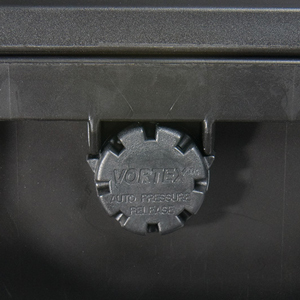 Pressure equalization might not be the first thing on your mind when you’re looking into a hard gun case, but if you’re going to be transporting your weapons then you’ll find these valves to be a lifesaver. Changes in pressure can make a case much harder to open, after all, but the big thing here is that it lets air pressure equalize without letting water in. The latches on the Storm series are a great alternative to the notoriously difficult to operate Pelican Protector latches. With a simple push and a pull, you’ll be able to pop the case open without having to exert a ton of manual effort. They’ll also be able to withstand nearly any kind of bump and fall they’re subjected to without popping open, making them great for the average consumer. 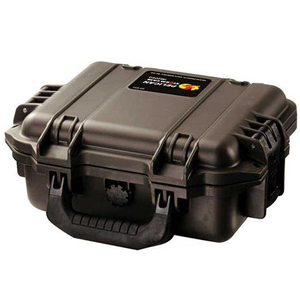 Like all Pelican cases, the Storm series is tough. Dust can get into firearms and cause some serious problems during long storage times, moisture is just generally a bad idea for your firearms, and if you’re transporting your firearms then you know the risk of crushing can be serious. Fortunately, the Storm cases are well-protected against all of these hazards, to the point they could be considered virtually accident-proof since it’d take a serious act of vandalism to actually damage the contents of the case. 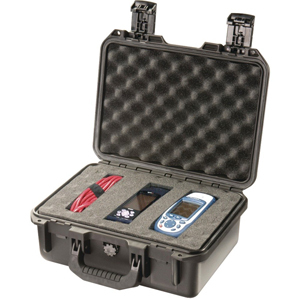 Pelican includes both interior and exterior measurements of their cases, so it’s easy enough to pick the right one out. There is one thing that you won’t know until you get the manual, however, which is that you also want to keep your firearms about an inch away from the outside edge of the case to avoid damaging the foam. So, as long as you remember that extra inch when you’re taking measurements you’ll be in good hands. 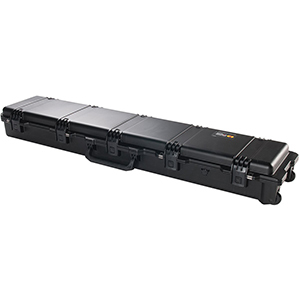 Pelican Storm cases come in a huge assortment of sizes. Many of them are suitable for carrying multiple firearms and accessories, something which hunters and those with big collections will be appreciative for. Our favorite way to ensure you can fit everything is to lay everything out how you’d like to have it in the case and then measure the footprint it takes up. Remember to leave an imaginary inch around the outside to avoid foam damage with your final case. It’s pretty easy to figure out which one is the best for you as long as you follow these guidelines. 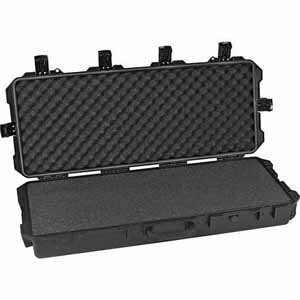 Since Pelican offers cases for all different types of equipment, from electronics to firearms, you’ll want to pick your foam type carefully. The Storm line offers three different foam types. Pick’N’Pluck foam is the easiest solution for many people, since it doesn’t require any specialized tools to work with. Instead, you’ll simply be able to quickly remove cubes of the pre-sliced foam in order to get a great approximate fit for your firearms and accessories. For firearms without expensive sights, this may be the best option although it will allow a little bit of movement in most cases. 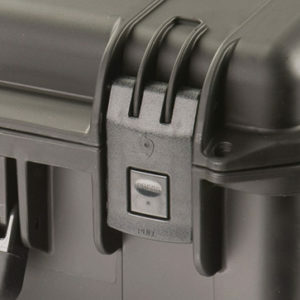 The solid foam which is available for many of Pelican’s Storm cases is the most customizable option. While you’ll need to do some specialized cutting in order to make sure that everything fits just right, you’ll even be able to keep high-end optics from getting banged around within the case and you can cut it to fit just about anything. If you’re willing to spend the time working with it, the solid foam is the best option for the majority of people. 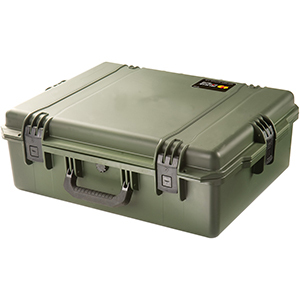 Pelican also offers some of their cases with a pre-sculpted hard foam designed to fit certain popular firearms. They’re available for most military rifles, and their civilian equivalents such as the AR-15, and some are even made for pistols. 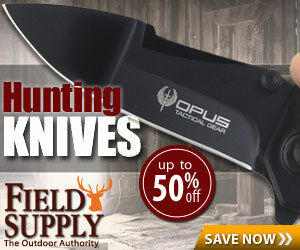 They’re a great option for multiple rifles of the same type or those who just want to be able to drop in their guns right from the get-go but they’re not great for those who have more unique firearms or want the most customizability within their case. 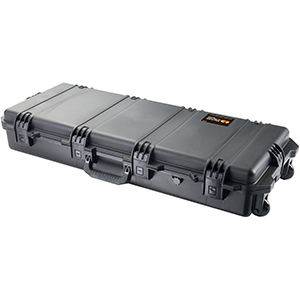 All of Pelican’s cases are guaranteed for life. If you haven’t modified the case or subjected it to ridiculous conditions outside of the parameters it’s been rated for, and you experience a failure, you’ll get the whole thing replaced. It’s an excellent way for the company to show that they definitely stand behind their products one hundred percent. For compact pistols, it’s hard to come up with a better case than this one. Featuring Pelican’s Storm design and being sized appropriately for both compact and subcompact pistols, this case might be a little bit tight for those who love accessories but if you’re just looking to move your pistol and an extra magazine or two you’ll be in good hands. This small case comes complete with Pick’N’Pluck foam. Sized perfectly for a full-sized pistol like a 1911 and complete with all of the features you’d expect from a Pelican case, the Storm 2100 is a great option for those who don’t have a ton of extras with their pistol. The interior dimensions will definitely allow for some extra magazine storage with all but the largest pistols and it comes with Pick’N’Pluck foam for ease of use. While the Storm 2200 runs a bit big for many people’s likings, it’s definitely a great choice for those who are looking to protect their pistols. The deep set of the case, in comparison to many other options, allows you to stack more accessories and ammunition and it comes with Pick’N’Pluck foam in order to make things easy for the end consumer. Unfortunately, that’s about it for the cases which are sized appropriately for a pistol when it comes to the Storm lineup. If none of these cases meet your size needs, then you may want to look into the Protector line for some slightly more expensive and heavier options which have a wider size range. Sized perfectly for AR-15 rifles, the Storm iM3100 comes with customizable foam which will allow it to fit a wide variety of carbines although longer rifles may need to be disassembled. It’s also got enough room for a pistol if you’re looking to transport multiple firearms, and the iM3100GP is also available which comes custom sized for an M4 and an M9 if military-style firearms are your thing. Coming with multi-layered foam which can be modified in order to fit just about any type of firearm, the iM3300 is a remarkably versatile case. Luckily for those who don’t want to spend the time cutting their own foam, you can also purchase one in either a scoped rifle or shotgun configuration in pre-molded foam as well. This is the beginning of the cases big enough to have wheels as well, making it easy to transport as long as the terrain isn’t too rough. For those who have exceptionally long hunting rifles, there’s still an option so you don’t have to disassemble and reassemble the gun each time you take it out of the case. The iM3410 fits this niche well, although you may be hauling a lot of your gear in a different bag or case if you’re intending to take it into the field. Like all of the Storm cases, however, it can definitely be counted on for high quality. The Storm lineup doesn’t offer quite as many different sizes as their Protector line, so those who are looking to protect an arsenal using only a few cases may want to look elsewhere. We do feel that one more case is worth recommending for those who are planning on looking at this line, however, the Storm iM2306 is perfectly sized for optics if you want to store your scope separately from your firearm and the extra protection is welcome even if you can’t afford the protection of one of the larger cases. If you’re looking for a lightweight but incredibly strong hard case for your firearms, the Storm lineup from Pelican is probably the stuff of dreams. While the Protector line takes the cake when it comes to real resistance, we think most people will find the Storm lineup to be affordable and easier to use, especially for those on a tighter budget.